When the hands are inside the areas between the axes, then it requires a closer look regarding the distances towards the 2 axes involved. I am really a novice at the 5 element hand reading, but the chart does look somewhat off due to the fact that the "average" male and female marks are below the "center" of the chart. PS I guess air hand is just not as common. Yes Tap, your observation is correct... but that relates directly to how the elemental hand shapes are defined. So, this is not an issue regarding the position of the hand shape axes. "If the hand has fingers that are longer than the palm..." and "If fingers are shorter...". This implicates that in the elemental approach (far) most people typically are classified as belonging in the 'short fingers' category - because less than 1% of people have fingers that are longer than the palm. 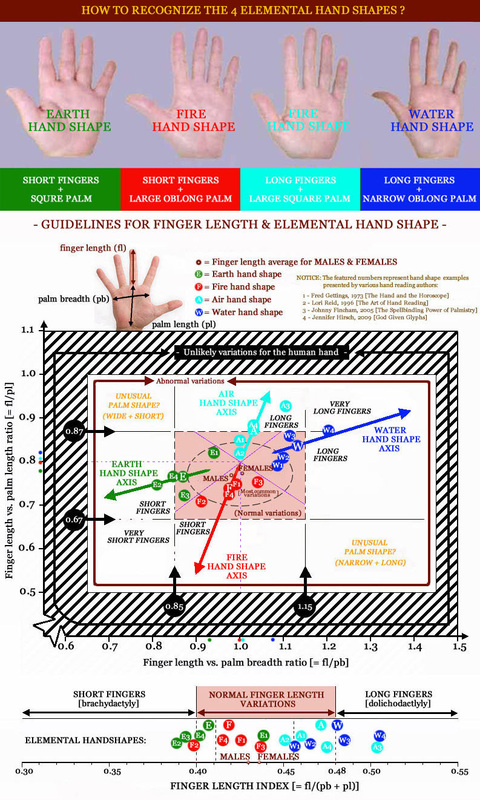 More important: based on this criterium one can expect 'fire hand shape' (short fingers + large long palm) and 'earth hand shape' (short fingers + squarish palm) to be most cost common. However, since squarish palms are not very common... this explains why the 'fire hand shape' is generally most common (especially in Europe & the US - I already have planned to present a chart describing the average finger ratios for various countries). Also, please be aware that the finger coordinates for average males and females is also very close to the 'neutral zone' - where the 4 hand shape axes start! Tap, I hope this explains enough why the average for males and females are found located close to the fire hand shape axis? Thanks, got it. While I was charting the hand shapes I noticed not one of them was "Air"...so I was just thinking about that (and that does correlate with your chart). Just surprised I did not have one "Air" shaped hand. Makes sense that the finger/palm length was moved from 100% + to 80% for the air hand. When you refer to the length of the palm in previous systems, you are assuming that they measured to the wrist. Personally I've never measured to the wrist. I measure to the high point at the heel of the palm to look for normal. It seems the best I can remember this is what I was taught in 1981 in the non-credit class I took at UC. It's in my earliest notes. The other standard was to measure the whole hand to the face... but that wasn't helpful if a person's hairline was missing. I can't remember where (I think Johnny Fincham), but I am pretty sure I read that air hand is found more in the Nordic region (I am doing too many things at once ..looked at his book briefly, but didnty see that). Patti wrote: When you refer to the length of the palm in previous systems, you are assuming that they measured to the wrist. Personally I've never measured to the wrist. I measure to the high point at the heel of the palm to look for normal. It seems the best I can remember this is what I was taught in 1981 in the non-credit class I took at UC. It's in my earliest notes. The other standard was to measure the whole hand to the face... but that wasn't helpful if a person's hairline was missing. "PALM LENGTH - Subject's right hand is extended, palm up. With the bar of the sliding caliper resting on the palm, measure from the proximal edge of the navicular bone at the wrist (wrist crease) to the skin crease formed where the middle finger folds upon the palm." NOTICE: The word 'navicular bone' was later replaced by the word 'scaphoid bone' - which is known to represent the heel of the hand (see: http://orthopedics.ygoy.com/2009/12/27/types-of-hand-fractures/). - and in most hand reading approaches. tap wrote: I can't remember where (I think Johnny Fincham), but I am pretty sure I read that air hand is found more in the Nordic region (I am doing too many things at once ..looked at his book briefly, but didnty see that). Correct. See: page 26 in Fincham's book (The Spellbinding Power of Palmistry). Sorry if I made some mistakes, it was late. I think my earth/fire hand that Martijn mentioned could be classed as earth shape. But my mistake was a good test, because the chart showed this! Tap one of the fire/water cases is borderline. The other one seems fire/water to me. I agree with not including my cases on the chart, I just posted them to see how they fit in, and because of that vertical line I found when I plotted them on the graph. Thanks for replying re how Lori's stats helped Martijn. Lynn wrote: Sorry if I made some mistakes, it was late. Yes, very nice to hear that the chart was right about the mistake! By the way, I was thinking... would you be interested to take a closer look at your favourite examples in your hand collection for each hand type? Then we can use your measurements as a validation test for the hand shape axes based on the examples in the 4 books. And then we can also compare these materials with your CS guidelines for a typical 'fire hand shape'! How does this proposal sound to you? I've just realised a problem, on the finger length thread where Martijn assessed my hands as fire/water. Martijn measures across the metacarpals, I measure across the centre of the palm, so all the data I gave you last night will be wrong according to Martijn's way of measuring (yet it fits into the axes!!). Lynn wrote: I've just realised a problem, on the finger length thread where Martijn assessed my hands as fire/water. Yes, that makes your earlier measurements so far irrelevant (except for your own hand measurements - which you reported to have been made at the metacarpals). However, no problem, Lynn... you are welcome to present new measurements. PS. Please be aware that working here with 'ink prints' could become problematic if you do not consider the 'clues' that signal the true borders of the palm at the metacarpals. posting new measurements isn't the solution as far as I am concerned. The problem is bigger than that. It means our two systems are not compatible because they present different conclusions as to hand shape. In your system I am fire/water handshape which is a different assessment from my fire (with a little air added from finger length). Fire/water does not fit the way I express myself out into the world! Lynn wrote: posting new measurements isn't the solution as far as I am concerned. The problem is bigger than that. It means our two systems are not compatible because they present different conclusions as to hand shape. In your system I am fire/water handshape which is a different assessment from my fire (with a little air added from finger length). Fire/water does not fit the way I express myself out into the world! ... Sounds like you are now suddenly jumping into conclusions based on your ideas about your behavior??? Lynn, in this new picture I have now made an attempt to estimate the STARTING POINT of the 4 axes - based on the distances between F, E, A and W buttons! The principle requirement that I have added here is that the axe of an element can not manifest in a zone which is at a smaller distance to 'average button' of one of the other elements. I think this choice makes sense....and I think your problem (regarding the water element) has now also disappeared completely. But does this make sense for you as well? Looking forward to hear your thought about this small (but important) modification! Martijn I also have an unanswered question. Did you check again the measurements on the handprint you posted? Lynn wrote: Martijn I also have an unanswered question. Did you check again the measurements on the handprint you posted? Yesterday, I tried to find out how you came to the 0.75 ratio (75%) of finger length versus palm length, and I found that you must have assumed that the palm length for that hand is MORE than 1/2 cm longer than is actually seen in the print. I assumed it to be not much longer than is seen in the print, which explains why I described that the fl/pl ratio is close to 0.80 (80%). PS. Looking forward to hear your thoughts about the new starting points for the axes. However it is important in checking how we measure hands!! No I haven't assumed anything about length of palm being 1/2 cm longer than it is! I printed it out. Measuring from top of palm under middle finger straight down (the ruler hits the bit where the palm curves upwards) - looking to the ulna side the lower moon mount is level with exactly 10cm. I measured the finger 7.5 cm. So, how are we measuring differently? Hmmm... I am not (yet) able to explain the difference that we found for that print. By the way, I always measure palm length at the center of the palm (and in cases where the upper wrist crease is not visiible - as in this case - I try to visualize where the wrist crease most likely can be expected). Lynn, if I follow your description literally about how you made your measured - this could indicate that you measured the lowest part under the mount of moon - as you mentioned 'looking to the ulna side the lower moon mount is level with exactly 10cm'? This could explain why you found a lower ratio than I did - because measuring a point under the ulna would/could create a larger distance to the beginning of the 3th finger compared to a central point at the wrist - but I am not sure that I understood your description properly...? PS. In general, I think we agree that ink prints are hard to assess precisely - so I am not sure that it will come much helpful to discuss the handprint that I presented. However, maybe as an alternative... I can propose that you might want to focus on my assessments for the hand photos taken from Lori Reid's book (which Patti presented in this topic) and the water hand photo presented by Gettings in his book. Or maybe you thoughts focus specific on the process of making measurements from ink prints??? by the way Martijn, one more unanswered question - does the person whose hand print it is have some learning disability? Yes, this handprint concerns a male who has fragile x syndrome. EDIT: PS. Lynn, I have checked my measurement on paper and on my computerscreen - resulting in scores above the maximum score that you just described. That leaves me only wondering if you have used the full fingerprint seen for the 3th finger... but I assume that you have used it. Hmmm... I guess then it must have been your printer that slightly changed the format of the hand print.